Simply stated, many researchers suspect that toxic chemicals are harming our children far beyond what we have recognized to date. Just as lead paint was once widespread before it was recognized as toxic and banned, many chemicals in today's baby mattresses, even though currently legal, are likely to eventually be banned as well. Many consumer products are made with chemicals which can be released from the product over time. These chemical ingredients are slowly released out of the product materials into the air where you (and your baby) can breathe them. The release of chemicals from various materials into the surrounding air is known as "off-gassing" or "out-gassing". You've probably experienced off-gassing. For example, that "new car smell" is, in large part, chemicals off-gassing from the vinyl and other materials in the car. The same thing happens in many crib mattresses—chemicals off-gas from the vinyl and foam in the mattress. You may or may not be able to always smell the chemicals, but they are there. Laboratory tests have demonstrated that chemicals off-gas from typical mattresses. There are also studies that connect these same chemicals to potential health effects. And, when it comes to chemical exposures, babies and children are the most vulnerable. Their immune and detoxification systems are not yet fully developed. They need our help. Thankfully, there are materials available with which we can make baby mattresses that do not contain these questionable chemicals. Babies naturally wet their crib mattress, spit up, and drip and drool milk and other liquids. Bacteria can grow on urine, saliva or milk, and a damp mattress can also grow potentially dangerous mold. A waterproof baby mattress just makes sense for good health. But, there's a problem: the waterproof surface of most baby mattresses is vinyl. And vinyl contains phthalate chemicals or similar plasticizers that are used to turn hard polyvinyl chloride (PVC) into soft and pliable vinyl. According to the American Academy of Pediatrics, "Phthalates are animal carcinogens and can cause fetal death, malformations, and reproductive toxicity in laboratory animals...children may be at higher risk of adverse effects of phthalates because of higher exposures during a time of developmental and physiologic immaturity..." As of February 2009, manufacturers of crib mattresses, children's toys and many other children's products were prohibited from using some types of phthalates in certain products, baby mattresses included. But other phthalates are still legal. Due to the recent government bans and a huge backlash against vinyl, mattress makers are scrambling to replace vinyl with "eco" or "green" models. Two surface fabrics they commonly use are damask and bamboo. But both of these fabrics have to be chemically treated to be even slightly water resistant, nevermind waterproof. Bacteria and mold can grow inside the mattress if the fabric isn't waterproofed. It only takes one accident to ruin the mattress. Most mattresses are filled with polyurethane foam, a highly flammable petroleumbased material that the National Association of State Fire Marshals calls "solid gasoline." It can literally burst into a ball of flame. Federal law mandates that mattresses meet flammability requirements, so flame retardants/barriers must be used. Animal studies show that some fire retardant chemicals can damage the liver, brain, thyroid, and motor control system, and cause hyperactivity. These chemicals can be released into the air that surrounds your baby as he or she sleeps. "Soybean Foam," "Soy Foam," "Eco Foam," "Bio Foam" and "Plant Derived Foam" are no better. Even though it sounds like the foam was all made from soybeans, it's actually the same polyurethane foam with a little soybean or castor oil added. "Natural latex" is derived from the sap of natural rubber trees, but is turned into foam in a factory, usually with the use of toluene (a carcinogen), ammonia, and sulfur. Because latex is acknowledged by experts as a common allergen, it has been banned in many schools, day care facilities, and hospitals. Natural latex is also hidden in another natural material: coir/coconut husk mattress fillings. Fibers from the outer shell of the coconut are dipped into "natural latex" to hold them together, thus coir/coconut husk mattress fillings have the same allergenic concerns as "natural latex." Although wool is often marketed as a natural waterproofing alternative, it is only water resistant, not waterproof. Also, many parents and doctors do not recommend wool for babies because it is a common allergen. Wool can also contain potentially harmful chemicals, depending on where the wool originates. We have carefully chosen our mattress materials to comply with these principles: Organic Cotton Fabric with Nontoxic Waterproof Cover Luxurious organic cotton fabric has an easy-to-clean clear food-grade 100% polyethylene waterproof coating. Polyethylene is used throughout the food packaging industry for its purity and nontoxic properties. Does not stain. Organic Cotton Filling Cotton is an ideal filling material that is both natural and renewable. Organic cotton is unbleached, undyed, and grown without synthetic pesticides, herbicides, or chemical fertilizers. "Do-no-harm" Fire Protection Baking soda and hydrated silica are both natural minerals with unique fire retardant properties. Bonded to cellulose fiber, they create a fireproof barrier that meets and exceeds all government requirements. Firm Innersprings Heavy-duty innersprings provide a firm, flat, yet comfortable, surface in accordance with pediatrician and Consumer Product Safety Commission (CPSC) firmness recommendations. We also offer various additional options on some models: "Seamless" Binding Instead of standard cording or taping covering seams along the top and bottom edges of the mattress (as with most mattresses), seams are heat-sealed, eliminating almost entirely external sewing/stitching. These smooth and seamless edges make for easy wiping and cleaning of the mattress, prevent potential moisture penetration, and close potential entry points for dust mites. Square Corners Our square corner innersprings provide the best fit, eliminating gaps between the mattress and the crib in the corners. Two-Stage Mattress (Dual Firmness) These mattresses have slightly different firmness levels on each side of the mattress. Many physicians and parents prefer a slightly firmer surface for infants, and a slightly less firm surface for toddlers. Waterproof or Non-Waterproof We recommend our nontoxic waterproof surface, but you can also order our mattresses with a non-waterproof organic cotton cover. 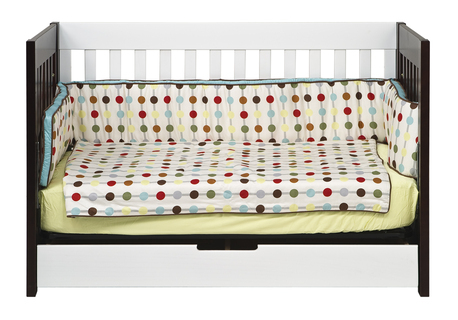 All our crib mattresses also fit toddler beds for years of usability.